Just an honest number of cycles, without stars or complicated tables. 1 litre = 33 complete washing machine cycles, 30ml per cycle. The Bottled Super-Concentrate Gel is without a doubt the INNOVATION in the Belarusian market of affordable washing detergents. Thanks to the high concentration of washing substances, you only need 30ml for one full load cycle (the concentration is just 1.5 times less than in the gel contained in the dissolving Corat capsules). The concentration of washing substances in regular gels for washing usually requires 75ml of gel for one wash. 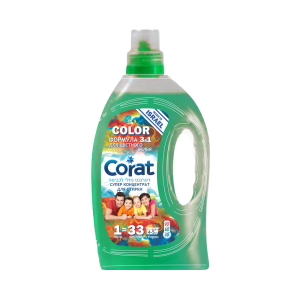 But one 1 litre bottle of Corat gel allows for 33 complete 4-5kg washing cycles at medium level of staining with medium hardness of water. Usage of the liquid gel-concentrate in bottle, as opposed to the capsules, allows for completion of any size laundry loads, thus saving the consumption of detergent during incomplete loading of the washing machine. Using the 1 litre bottle has the additional and undeniable advantage, as it saves you energy during your trip to the store and requires minimal time spent next to the washing machine, as it can easily be stored on any shelf. With a light weight (around 1kg), the Corat super-concentrate gel is very easy to pour into a measuring cap even for a person with limited physical capabilities, which is another undeniable advantage over traditional washing detergents.